Wow! I don't know what it's like where you are, but we are suffering through a heat wave. It's been in the 90's (Fahrenheit),or close to it, for nearly a week. This is after it had been so cold that I had closed all the windows and put extra covers on the bed. Yesterday Lori and I went to the flea market,in a more southern part of the state, and it was monstrously hot.We both were feeling drained, headachey,and sick. Fortunately I had remembered to bring my hat, my sunscreen, and plenty of water. This was one of the BIG flea markets of the year. This is the one where I usually fill my cart, and yesterday was no exception. In spite of the fact that this is mostly a farm flea market,with plenty of animals and guns for sale, I usually find something I want. I told Lori yesterday that there seemed to be more stuff at the flea market this time. I saw a lot of stuff I might have bought, but the prices seemed to be extra high too. But I did find quite a few things at decent prices,and I'll be sharing those with you over the next week or so. Today's doll are some I got at the flea market yesterday. They're what Ken referred to last night as 'the twins on the counter'. 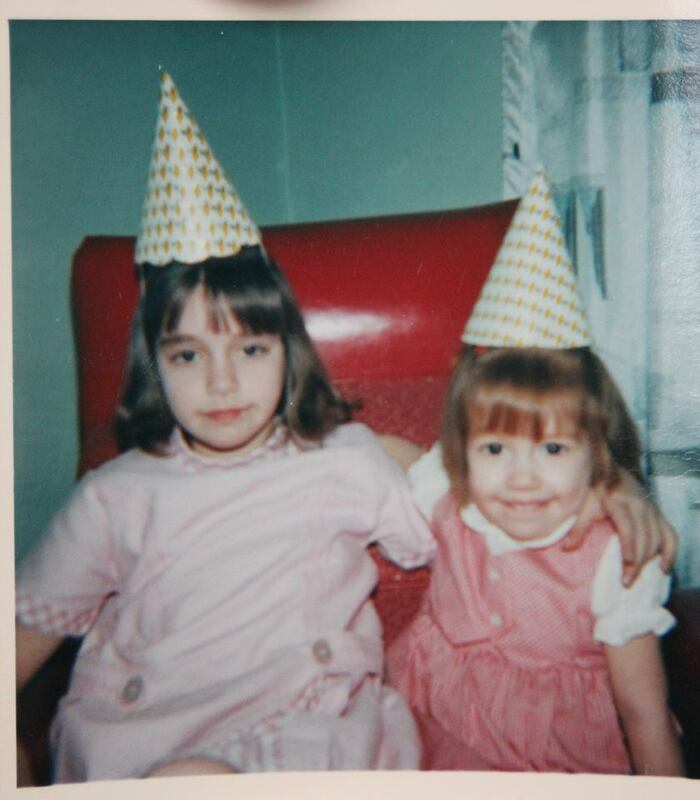 They kind of remind me of me and my sister we were little. They aren't twins Ken! They aren't even made by the same company. First of all, I have to tell you how they were found. A lady had a corner set up with boxes of her stuff,just piled around. Alot of it was pretty nasty because, she said, it had come straight from the garage, where it had been for a long time. 'He',(I'm assuming her husband.) had demanded that he 'needed more space',so she was to get rid of everything. With that being the situation, she was willing to sell anything for anything she was offered. And with that being the situation, I was willing to make offers! 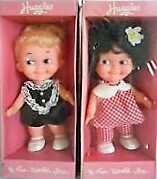 I got these girls and one other larger doll with a head problem,(The problem was that it wasn't attached! ), for a total of $1! It was a good deal, but I got the bargain for a reason. Here's what they looked like when I got ready to clean them up last night! Pretty cruddy, huh? Don't think there wasn't some heavy duty soaping going on. Actually though, hard scrubbing wasn't required. The dirt came off pretty easily. They were naked when I bought them though, so I had to find them something to wear. I'm sure I have something better that will fit them, but today this is all I could find. These clothes came from a yard sale haul I showed you a few weeks ago. It was waaaaayy too warm for sweaters today! The smaller one is marked Fun World. Fun World made a lot of dolls in the 60's and 70's. They made Strawberry Shortcake clones 'Baby Petals',and Milk Shake,Bubble Gum,and Chocolate Pudding.They were responsible for this cool set I bought a couple of years ago. One of their most well known dolls is Susie Slicker,like this one of mine you may have seen before. Our doll today is called Huggles, from what I have been able to find,and she was made in a variety of hair colours and outfits. She measures about 6 3/4" tall. Once she was cleaned the damage to her nose showed up. She has posable arms,but her legs aren't jointed,so she can't sit down. The taller girl is marked only Made in Hong Kong on her back and the back of her head. She stands about 7 1/2" tall. She's jointed at the neck, shoulders, and hips,so she can sit down. She has a much more serious face. I prefer the goofy face of the smaller doll. Her head is sort of weirdly shaped too. Look at that. Whether it's from years of being in a box in the garage, or she is just made that way, who know? Still my favourite. Too bad she has those weird butter lips. Tomorrow we'll see what else I sort out from the flea market to show you. It has been unpleasant up here as well, but not nearly as bad as you, it sounds like. It has only been in the low 80s here. Doll-A-Day 2017 #268: Takara Part 1: Licca Chan? Doll-A-Day 2017 #262: Newborn Baby So Beautiful.